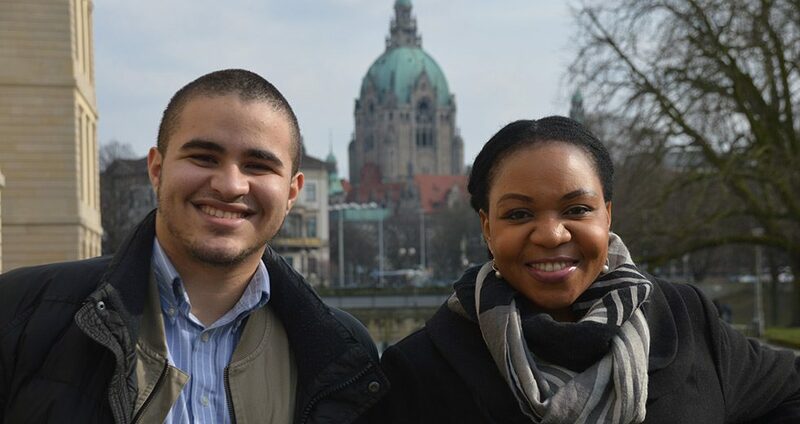 Each year the staff of the World Communion of Reformed Churches welcomes one or two new young adults as interns to its offices in Hannover, Germany. Interns have come from Indonesia and South Africa, South Korea and Taiwan, the United States and elsewhere. With a commitment to ecumenism, they seek connections, experiences and opportunities. This year’s interns are no different in that regard, and they have the special opportunity to assist on this summer’s General Council, to be held in Leipzig, Germany. “In the upcoming year I am excited about being on the team that is directly involved in the preparation of the WCRC’s General Council,” says Grenna Kaiya. Grenna is from Malawi but has lived most recently in Oslo, Norway, where she was doing post graduate studies in Diakonia and Christian Social Practice and in International Relations. Miguel is a Puerto Rican university student, studying engineering, and has been a youth leader in his church on the island. During an intern’s year with the WCRC, they participate fully in the life of the organization, coming away with a richer understanding of the greater church, its role in the world today—and friendships that span the globe. “The thing that interests me the most about the ecumenical movement is that humanity has always been very capable of noticing the things that divides us and the things that makes us different. The ecumenical movement is the place where we start to look for the things we have in common, and we start working together as a family,” says Miguel. Miguel plans on first finishing his degree. And then? “After that I would like to continue and do my Masters degree either in theatre or go to seminary to study theology and the ecumenical movement from the perspective of the youth in different contexts,” he says. But their next steps are many months—and a General Council—away, and right now they’re immersed in the growing number of details to bring together hundreds of people around the world to discern God’s will through Scripture to set the WCRC’s direction for the next seven years. Grenna’s responsibilities for the Council are wide-ranging and include contacting member churches that have not yet nominated their delegates, helping the finance office in filing and assisting the communication office. The WCRC’s internship programme is funded primarily by a grant from the Evangelische Missionswerk with additional funds contributed by the Council for World Mission, the Presbyterian Church (USA) and the Presbyterian Church in Taiwan. Individual donations are also welcome!